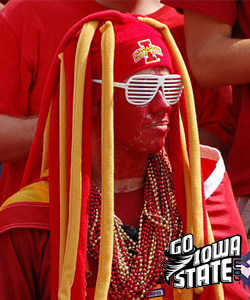 Ames, IA – The Iowa State Cyclones now have a one game winning streak, hey it sure beats a 10 game losing streak. Paul Rhoads collected his first career victory as a head coach in a solid, but not spectacular win over the North Dakota State Bison. Major improvement is needed in all areas if the Cyclones hope to grow the winning streak. There were many good things that we saw, and some not so good. Overall it’s a win and a 1-0 record heading into their game next week with the Hawkeyes. However, before we move on let’s discuss the good and bad from last night. 1. 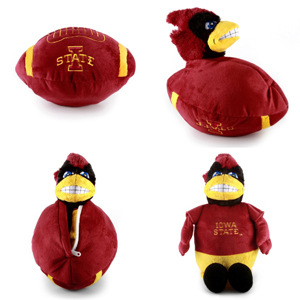 Iowa State was by far the better team in the fourth quarter. 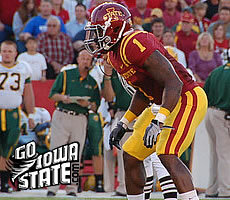 The Cyclones offensive and defensive lines wore down the Bison over the course of the game. Will this trend continue against better competition? 2. The Cyclones were penalty free for the majority of the game. Leonard Johnson was penalized late in the game when the outcome had already been decided. 3. Iowa State fans came through BIG TIME, almost 49,000 people packed in to Jack Trice stadium Thursday night. How many teams coming off a 2-10 season with 10 straight losses get that kind of support? 4. David Sims. We may finally have a Big 12 caliber safety in our lineup. Sims is burly, fast and makes punishing tackles. Sims also looked really good on kick returns. The Bison kicked away from Leonard Johnson to begin the game and kicked away from both at the end of the night. 5. The opening drive on offense. Iowa State marched down the field driving 81 yards on 9 plays with Alexander Robinson finishing it off with an 18 yard TD run. 6. Special teams were really good all night. We mentioned Sims looking good as a kick returner with the highlight being a 60 yard burst up the seam. Josh Lenz is a fearless as a punt returner and showed really solid hands. Michael Brandtner boomed several long, towering punts. Grant Mahoney drilled two field goals including a 50 yarder, his only miss came from57 yards at the end of the first half. 7. 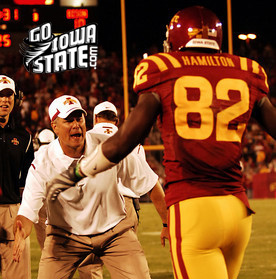 The ISU offense racked up 442 yards of total offense, 204 rushing yards and 26 first downs. 8. Austen Arnaud had what we would consider a below average performance for him and he still had 305 total yards and 3 touchdowns. 9. The defense gave up a few big plays, but for the most part kept things in front of them and made the Bison earn their yards. 10. Marquis Hamilton had a coming out game. Big Body seemed to be in the dog house for whatever reason with the previous coaching staff. Hamilton found the end zone twice on receptions of 39 and 42 yards and had the most memorable block of the game as well. 1. 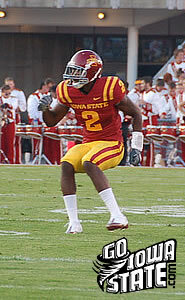 The ISU coaching staff talked this offseason about how important it is for them to control the tempo. We felt the Bison won the battle of tempo and actually held the ball for 33:18 compared to the Cyclones 26:42. 2. Iowa State didn’t have working headsets for the vast majority of the game. Meanwhile the Bison coaching staff was fully operational. Some home field advantage. Get it fixed. 3. Sedrick Johnson left the game with a sprained ankle in the first series. It didn’t look too serious, but it is a good thing WR is our deepest position because the wideouts seem to be dropping like flies. 4. No pressure on the QB. We ended up with 4 sacks on the night, but 3 of them came late in the second half. Some of this was do to short drops by the Bison, but it worries me that our front four can’t get pressure on an FCS school. 5. Austen was too “amped up” for the game. It took him a while to calm down and play relaxed. He came out throwing too hard and overthrowing targets. 6. Secondary was out of position on the 18 yard TD pass. Cyclone defenders were scrambling to get in position when the ball was snapped and the result was 6 points. 7. We love Alexander Robinson as much as anyone, but the fact that no other RB saw the field until late in the fourth quarter is a tad worrisome. Minus the fumble, Jeremiah Schwartz did look good when he got in to the action. 8. Tackling. Obviously much improved from last year, but it still seemed like there was too much grabbing and not enough wrapping up. The second half was much better then the first. 9. Arnaud made a poor decision on the fumble. It was a broken play and he made it worse by trying to make a late handoff. 10. Giving up 210 yards on the ground. NDSU has a nice scheme and knows how to run the ball, but teams with much better rushing offenses are lined up on the schedule.